If you’re in North America, then it’s likely that you’re starting to feel the change in temperature indicating autumn weather. For many gardeners, this also means that we’re getting closer to the end of the growing season. Choose the right plants. We couldn’t agree more on this one. Some plants thrive more in cooler weather than other plants, and even some varieties of the same plant handle colder temperatures better than other varieties. Simply planting the right varieties of plants can give you more overall crop yield this year. Use green houses. Some may say that this is “cheating the system,” but, hey, who says that you have to play by everyone else’s rules (and deal with their seasonal limitations on when you can eat your favorite vegetables)? A green house allows you to create a mini-climate for the plants in the green house so that you can, effectively, extend your summer growing season for your plants in that greenhouse. A cold frame (a mini-greenhouse around one plant) is another option if you don’t have a lot of building materials or don’t want to build a full-sized greenhouse. Use microclimates. Essentially, this idea is that some parts of your garden will frost sooner (such as those parts behind barriers or in low lying areas), and some areas will stay warmer. In other words, know your garden, and make use of this knowledge to plant where your crops will survive and produce longest. Build rich soil. Make sure that your plants have the nutrients that they need from the soil to not only survive but to thrive longer into the colder months. Now, none of these ideas are particularly difficult to work with. They simply take some forethought and planning to make the most of your available options. 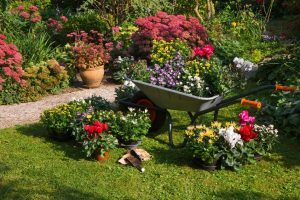 But, if you take that forethought, then you may find that your garden is helpful for a longer period of time each year.